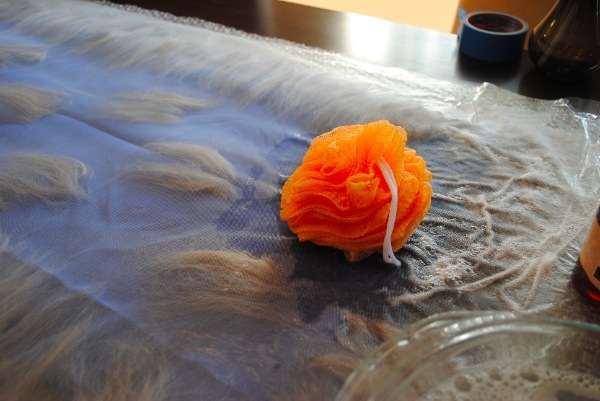 “Nuno Felting,” which is also known as “Laminate Felting” is a process where the silk fibers of a scarf are felted together with wool roving. I found out that it definitely takes a lot of elbow grease! However, the outcome is very interesting and unique. The first blue scarf was made with wool on both sides of the fabric and the second red scarf was made with wool only on the top. Since you will be making these by hand, you can really choose whatever design you want–I chose polka dots and ruffles for the blue scarf and a fun lattice design for the red scarf. 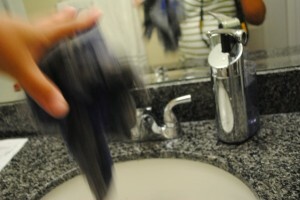 Click on “Continue Reading” to see my FULL STEP-BY-STEP TUTORIAL. 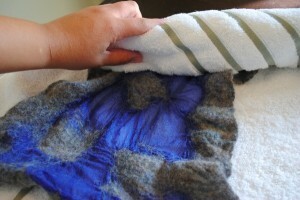 One of the best felting resources that I found online is at feltinglessons.com. 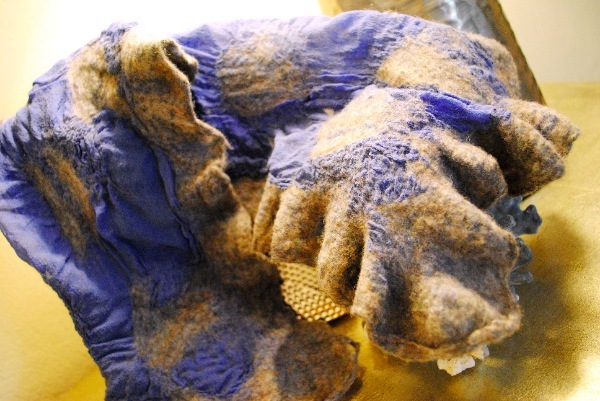 They have a number of videos that show you great tutorials for wet felting, nuno felting, and a few other felting techniques. I found my silk locally at Thai Silks in Los Altos. It is such a great little local shop! 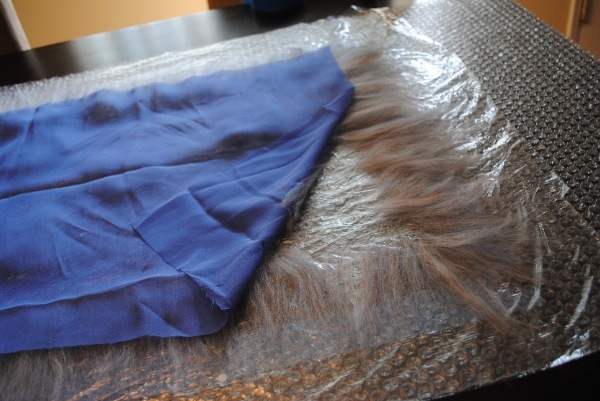 I could browse their silks for hours. 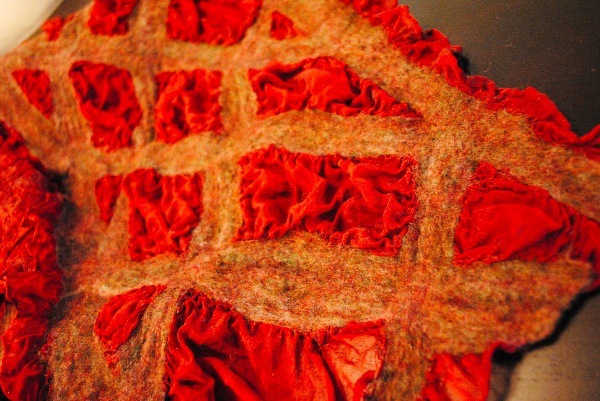 They have everything from rough silks, silk dupionis, chiffons, and hundreds of bolts of exotic silks. If you do not have the luxury of having a local specialty fabric store nearby, you can find silk fabrics at many big-box fabric stores. 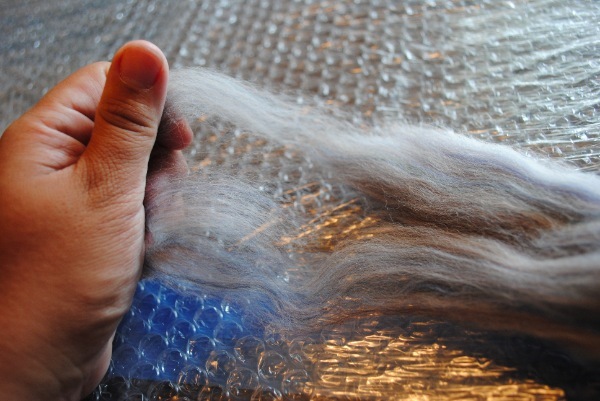 The wool roving is the same that I use to spin yarn and can be found at various stores online. One of my favorites is the little shop in Solvang named Village Spinning and Weaving. 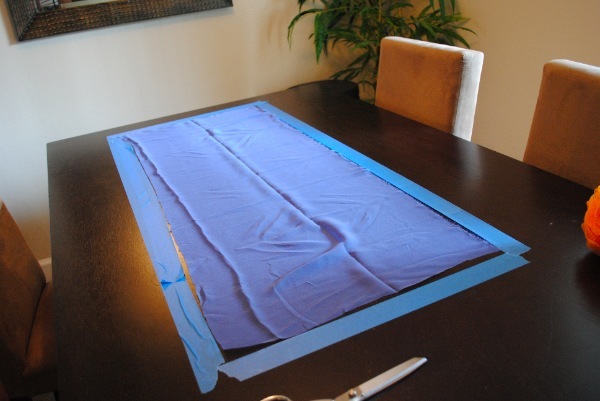 2) If you are going to do wool on both sides, tape out where your fabric starts and ends so that you know where to lay down the bottom layer of wool. If you are only going to put wool on one side of the fabric, you can skip this. 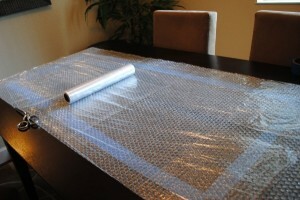 3) Lay out your bubble wrap bubble side up (and plastic wrap if you are going to have wool on the underside). 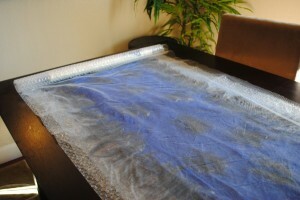 If you are only going to have wool on the top of the fabric, you don’t really need to put the plastic wrap. The plastic wrap is used so that the wool fibers on the underside don’t get smooshed in with the bubbles. 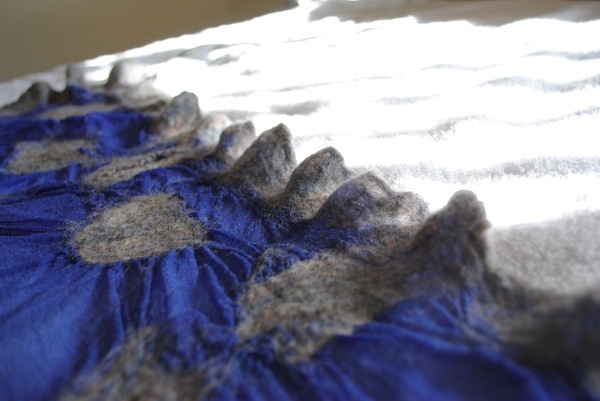 4) Gently draft out your wool roving and place it where you want your design to be (once again, on one or both sides of the fabric, making sure to stay within the lines if you are going to do wool on both sides). 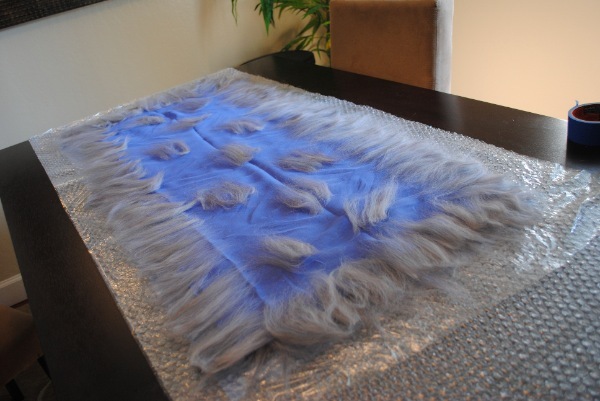 TIP: you don’t need to use a huge amount of roving unless you want the felt to be very thick. A little bit will go a long way. 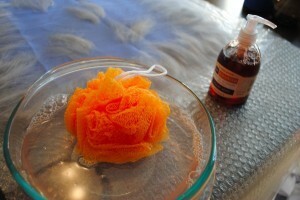 5) Mix together your water and a few pumps of liquid soap. 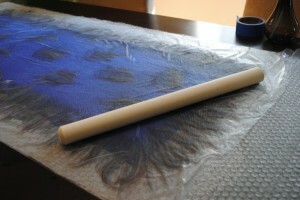 Lay out the Tulle on top of your project and gently loofah some of the mixture on top. You don’t want to over-saturate it, but you want to make sure that the entire project is nice and wet. The tulle helps to hold your project in place so that your design doesn’t get messed up. 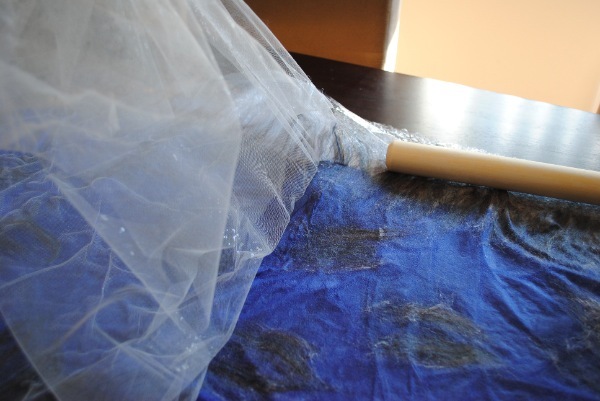 TIP: You can see in the picture that when the tulle gets wet it might get a little wrinkly–gently use your hand to get it nice and flat. 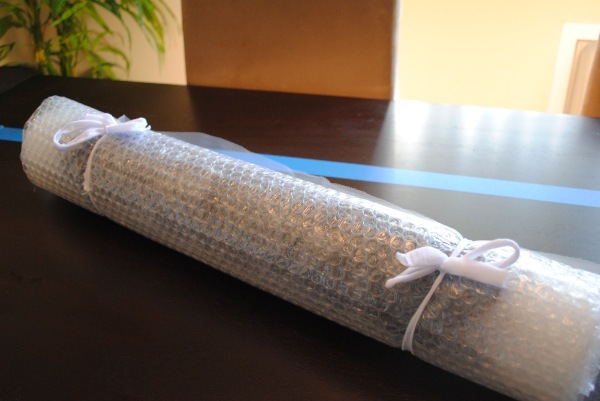 6) Get out your rolling pin/dowel/pool noodle/other round something or rather and roll it up with the bubble wrap and your project. 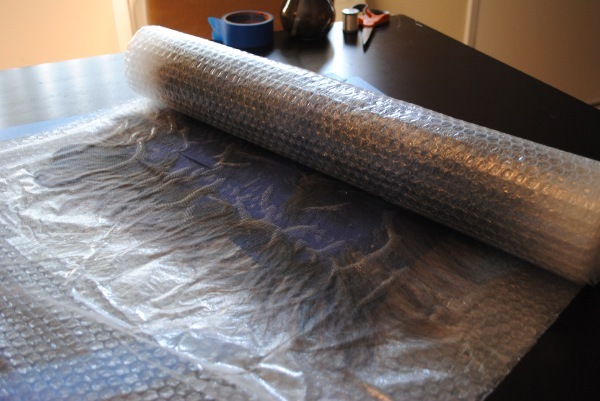 Having this in the center will give a nice foundation for when you are rolling the log of bubble wrap. 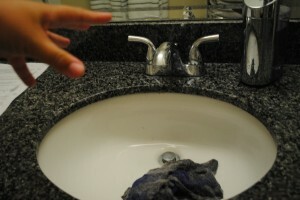 7) This is where the elbow grease comes in. Once you have it rolled up, tie it and roll it on the table for a few minutes or 150 times… Don’t use up all of your energy because you are going to have to do this again from the other side. 8) Reposition your tulle so that the wool fibers don’t get too stuck into the holes. Lay it back on top of your project and roll it up again from the opposite end. Tie it back up and roll it for a few more minutes or another 150 times or so. I told you this was a lot of work! 11) You’re almost done! 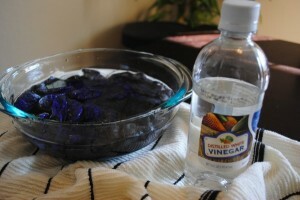 Rinse it in cold water and then let it sit in a mixture of cool water with a little bit of vinegar for 15 minutes or so. 12) Rinse out the vinegar with some cool water, squeeze out any excess water, and roll it in a towel to get it as dry as you can. Then open it up and reshape it to how you want it to be (I wanted it to have some ruffles on the edge so I used my hands to shape the ruffles by pressing it between my fingers). 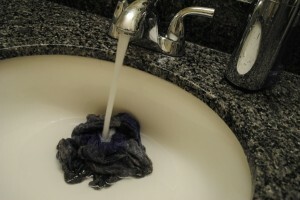 13) Lay it out flat to dry and then enjoy!